Experience the Difference! Tri-City Motor Speedway hosts Friday night stock car racing late April through early September. Don’t miss out on the fun any longer! Bring your family and friends to experience the thrill of the races and make unforgettable memories. The 3/8 mile clay oval track provides on the edge of your seat action for fans of all ages. 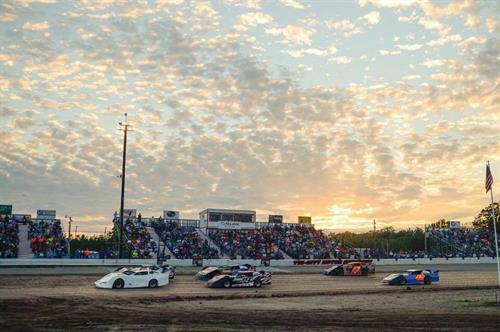 Tri-City Motor Speedway is conveniently located in Auburn, Michigan on Wheeler Road by 8 Mile Road. Weekly Classes: Late Model, IMCA Modified, Pro Stock, Street Stock, Front Wheel Drive Bomber Stock. Special Shows include traveling series and Winged Sprints. Weekly Adult Admission $14, 55 & Better $13, Kids 7-15 $5, 6 & Under $FREE. Prices increase for special shows. Food is available for purchase. Coolers are welcome, NO GLASS. Friday - Pit Gate opens 5:00, grandstand gates open at 5:30 and racing starts at 7:55 pm. Come early to get a great view of the action. Visit www.tricityracetrack.com/schedule for the entertainment schedule & much more.